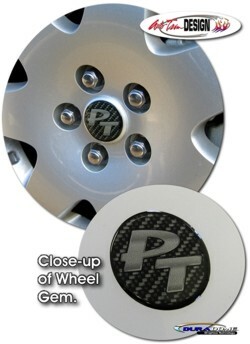 Detail your PT Cruiser's rims with these "PT" badged Simulated Carbon Fiber "Polyurethane Domed" gems that fit perfectly in the factory wheel centers. You are provided with a set of four (4) gems that are 1.938" (4.92cm) in diameter. While this item should fit just about any year PT Cruiser, we recommend measuring your wheel's centercap prior to ordering.